Chinese Wearables Makers Begin to Introduce Low-Cost Devices Supporting NFC Payments | NFC Times – Near Field Communication and all contactless technology. Low-cost Chinese wearables maker Huami has introduced its first smartwatch supporting NFC, as well as QR code, payments. The device maker is promoting use of the watch for transit ticketing. Large Chinese OEM Xiaomi has also introduced a low-cost fitness band supporting NFC payments. 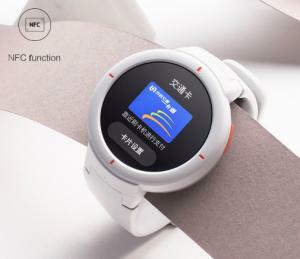 NFC TIMES Exclusive Insight – A new smartwatch from low-cost Chinese wearables maker Huami and the latest fitness band version from Huami’s major investor and partner, Xiaomi, both support transit and retail payments–making them among the first budget smart wearables devices supporting NFC payments. The devices could help usher in a new phase in the payments wearables market, in which more affordable devices support NFC chips and payments applications, in addition to QR code-based payments. Huami last week unveiled its watch, Amazfit Verge, at a suggested retail price of only CNY 799 (US$116). In addition to NFC payments, the watch will also support one of China’s two dominant digital payments services, Alipay, with QR codes-based payments. For now, Huami appears to be emphasizing NFC for what it says will be more than 160 cities supporting fare payments with the watch. Article has about 900 words.